A farmer who runs a mid-sized vegetable farm fires a worker. The only reason she gives is that the worker wears purple too often. Does this farmer have the legal right to fire a worker this way? When I ask this question of the would-be farmers who take my workshop on creating a fair farm only about half get the answer right. If you employ workers on your farm or you are thinking of hiring workers, it is a good idea to inform yourself about the legal responsibilities of farmers and the rights of farm workers. The answer to the question above about the employer’s right to fire a worker for no particular reason is yes: at-will law (present in 49 or the 50 states) allows employers to fire workers without the need for providing a “just cause” or a warning. However, there are many limits to this right of the employer. An employer cannot discriminate against a worker for a whole list of reasons that include race, ethnicity, or age. An employer cannot fire a worker for getting sick or injured. Farmers are advised to develop clear written policies and contracts and to discuss their expectations with employees and even post the policies for all to see. For a template for labor policies that farmers can download and adapt for their farms, see the Agricultural Justice Project (AJP) tool-kit: (http://agriculturaljusticeproject.org/?page_id=116.) Courts tend to interpret employee handbooks as promises to follow the written procedures they contain, so if an employer does not follow his own rules, the court may side with the worker. At-will, of course, gives workers the freedom to leave too, but the power in the situation is very much with the employer. To prevent successful lawsuits by disgruntled former employees, a smart employer will have written policies, adhere to them, keep a file with a record of every evaluation and warning, and be able to show a good reason for terminations. It’s wise to maintain transparency and allow employees access to these files as well as encouraging everyone to discuss issues openly. Workers have the right to a safe work place. If an employee is hurt on the job, the employer is liable for damages. That is why most farm employers invest in Workers Compensation, insurance that covers on the job injuries and disease. Workers Comp for farm labor is a legal requirement in most Northeast states. 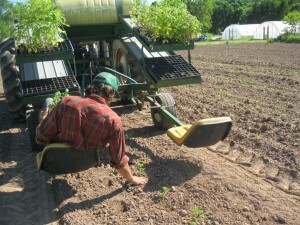 NY and VT exempt farms with very small payrolls – $1200 a year in NY, $10,000 in VT. Part-time employees, borrowed employees, leased employees, family members and volunteers are included under the workers’ compensation law. Also included are unpaid student interns. For only a few dollars more, employers can add disability insurance that covers off-farm illness and injuries to employees. NY workers’ compensation law excludes farm laborers from the requirement that employers provide disability insurance to employees. Workers’ Compensation is a “no fault” system – who is to blame for an injury is not an issue. Ultimately, the Workers’ Compensation Board decides whether an injury or illness is covered. Abundant information on farm safety is easily available. The New York Center for Agricultural Medicine and Health (www.nycamh.org) has a remarkably thorough collection of guidelines in both English and Spanish for preventing accidents on farms covering tractors, PTOs, hearing protection, manure pits, livestock handling, etc., etc. In NY and a couple of other NE states, NYCAMH will provide farms with FREE on farm safety assessments and safety training. They are also offering small grants to improve farm safety from the John May Farm Safety Fund. In its tool kit for farmers, the Agricultural Justice Project (AJP) provides a guide to creating a farm safety plan and model farm safety policies The Occupational Safety and Health Act of 1970 gives employees the right to file complaints about workplace safety and health hazards, and, if you fear retaliation, you can request that your name not be revealed to your employer. Employees can make complaints online at www.osha.gov, or download a complaint form and submit it to the regional OSHA office. Additionally, if a farm does not have more than 500 days of agricultural labor in a year (roughly equivalent to seven employees employed full-time in a calendar quarter) the farmer is exempt from paying federal minimum wage. But that is not the end of the story. Farmers must still comply with state minimum wage laws which vary by state. New York, Rhode Island and Connecticut require agricultural labor to be paid at the general state minimum wage which is $9 in NY and $9.60 in CT and RI. In Vermont, New Hampshire and Maine, agricultural work is exempt from the state minimum wage so is paid at the federal rate unless exempt under FSLA. Currently the federal minimum wage is $7.25 an hour. Massachusetts has an agricultural minimum wage of $8 an hour. Meals and lodging may be credited against the minimum wage, but only with a written agreement between the employer and the employee, and the limits are different from state to state. 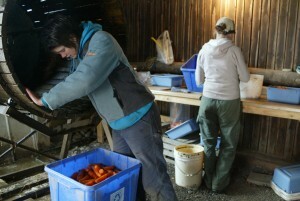 Some people take up farm work as a way to learn the skills for owning and running their own farm someday. Others do farm work for many years and may even choose to make that their life’s work. Our movement for a local, sustainable agriculture needs both more farmers and more professional farm workers. Knowing the responsibilities of an employer or the rights of a worker provides the basis for a positive relationship so that small farms function as integrated teams. In her keynote speech at the NOFA-NY Winter Conference, Rosalinda Guillen, Director of Community to Community, spoke eloquently about “good hard work,” and about how her father, a long time farm employee, taught her and her siblings to work with pride and with appreciation for the beauty of working close to nature. If we want our network of small farms to be a way of life that is worth sustaining, farm work must be a respected vocation that is compensated appropriately for the values farm workers provide for society. California Guide to Labor for Small Farms, Aug. 2013 NCAT and CA FarmLink. – Much of the information in CA specific, but some applies country wide. Main goal of publication – to boost on-farm learning opportunities and help farms that train interns do it legally. Appendix has template for intern contract and a sample time card for employees. Farmers Guide to Farm Employees: Federal and Minnesota Labor and Employment Law for Small-Scale Family Farmers, August 2012, Farmers’ Legal Action Group, Inc.
Farmers’ Guide to Farm Internships: Federal and Minnesota Labor and Employment Law, February2013, Farmers’ Legal Action Group, Inc. The On-Farm Mentor’s Guide – practical approaches to teaching on the farm ($35) *DACUM Occupational Profile for On-Farm Mentor, 2001.